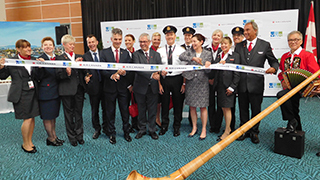 Anne Murray, vice president of airline business development and public affairs at Vancouver Airport Authority, and Pascal Bornoz, consul general of Switzerland in Vancouver, cut the ribbon and launch the Zurich route. 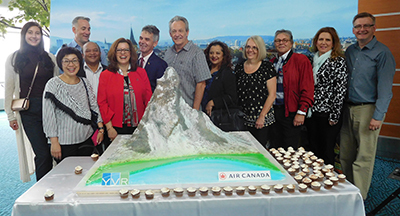 Edna Ray, Air Canada’s RSM for British Columbia, with the Matterhorn cake before she boards Air Canada’s inaugural flight to Zurich. James Howey, manager of business development in Western Canada at Air Canada, sizes up the celebration’s Matterhorn cake. 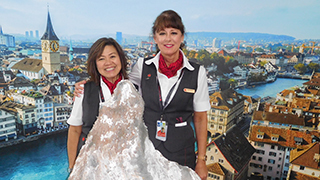 Marjorie Gaylie, premium agent at Air Canada and Peggy Puratich, meet and assistance agent at Air Canada, with the Matterhorn cake. 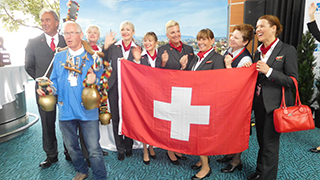 The crew on Air Canada’s inaugural Zurich flight celebrate with Swiss flags and cow bells. Traditional musical performers entertain the crowds at the departure gate. 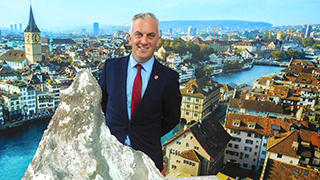 Airline and airport representatives pulled out all the stops at the inauguration of Air Canada’s new Zurich service from YVR this week. 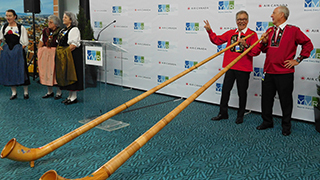 Passengers, press and industry reps were treated to traditional musical performances and tasty treats at the departure gate. The crowd was entertained by Alpenhorn players, singers and cow bell players and dined on chocolate fountain treats and a cake in the shape of the Matterhorn! The celebration also marked the launch of the carrier’s new seasonal service to Paris, which was being inaugurated the following day. The new services bring the total of Air Canada’s non-stop European routes from its Vancouver hub to five. The routes will be served with the airline’s 787-9 Dreamliners, which feature business class lie-flat pod suites, as well as premium economy and economy class seats. 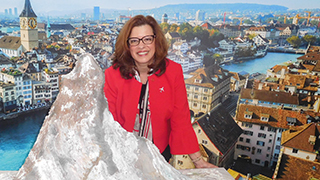 As well as regular pax, the inaugural ZRH flight hosted a group of 12 excited travel agents led by Edna Ray, Air Canada’s regional sales manager for British Columbia. “I’m extremely proud of the group that we have,” said Ray. 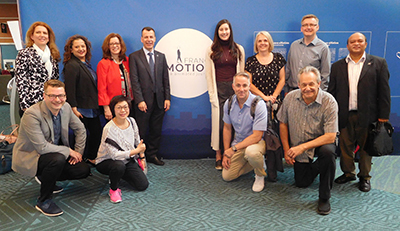 “All the agents participating in the FAM completed the Air Canada Global Sales University and the Switzerland Travel Academy and are Lufthansa Experts, so they are all super-committed. “We’re growing this Vancouver hub so much,” she enthused. “A lot of what we’re doing here isn’t necessarily just point-to-point; it’s also because we have such a good global network. It’s about the connectivity in Vancouver. The event also saw the opening of the interactive ‘France Emotions’ exhibit at the airport. A joint initiative between Atout France and the Institut Francais, this travelling exhibit celebrates cultural sites throughout France in 35 original art pieces that come alive through augmented reality. To enjoy, travellers just download the free ‘France eMotion’ app and point their phones at the images. Travel agents prepare to board Air Canada’s inaugural flight to Zurich. AM trip travel agents check out the ‘France Emotions’ exhibit at the airport.